Home > Farmigo Basics > Payment Methods > How do I accept EBT? The number of farmers' markets licensed to accept SNAP/EBT benefits is increasing nationwide. As people discover the benefit of buying fresh, nutritious, local products, farmers and farmers' markets are seizing the opportunity to broaden their customer base by adding a SNAP/EBT payment options. 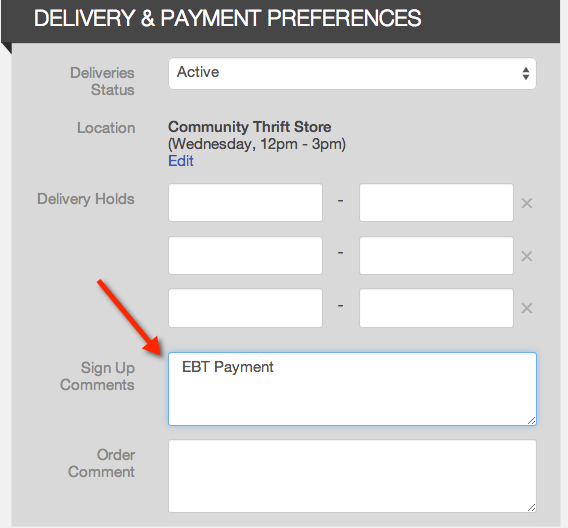 Enable the “Other” payment method with the following note: “Need to set up EBT payments? 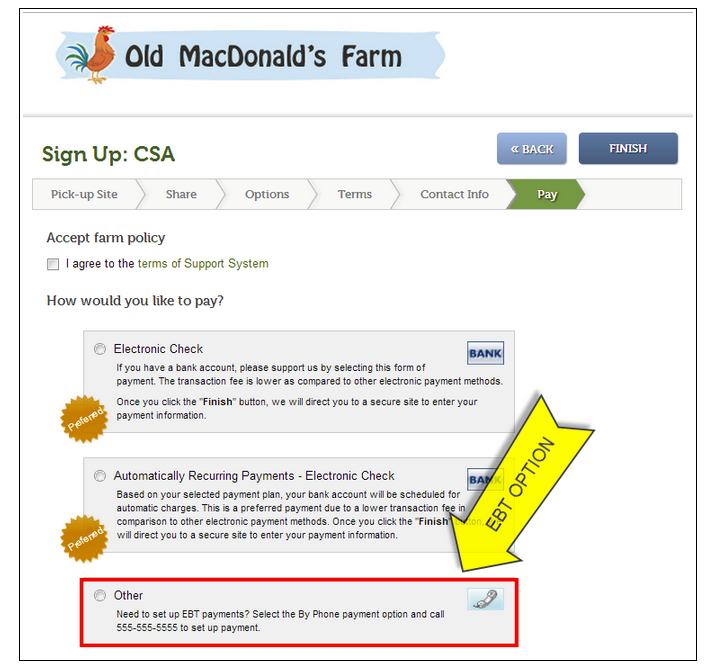 [Enter instructions for how you will be accepting EBT]"
How Member Selects EBT Option. The member will begin the sign-up process link any member by selecting their pick-up location, share and options. In the Terms step of sign-up process, the member will select the designated EBT Payment Plan. 4. Once the member clicks the “FINISH” to complete the sign-up process, they will be sent the “Automated Email - Signup Confirmation”. We recommend editing the Sign Up Comment field of the member's page to include a note regarding EBT payments. Go to the Order tab of the member’s file and add a note to the Sign Up Comments field to indicate that they will be paying by EBT at pick-up. This will allow you review who needs to pay by EBT at pick-up by using the Labels report (CSV output) or Distribution report. 3. Each time that the member gives you payment, open up the Payment tab of the member’s file and add a payment with the payment type of “Terminal”. 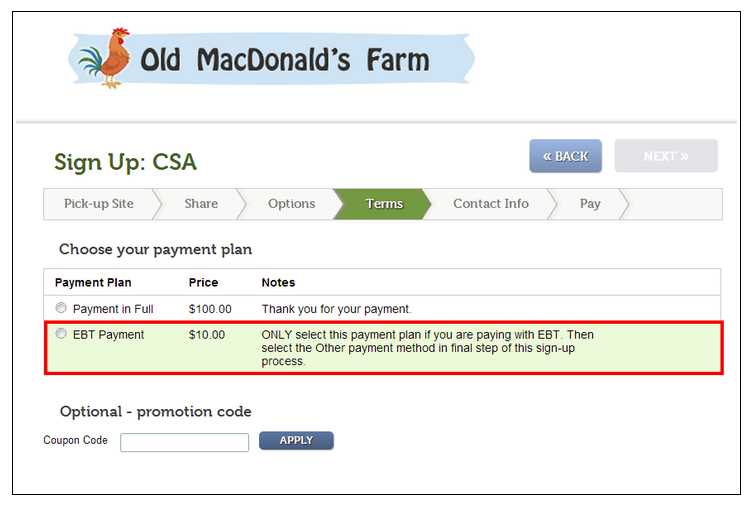 You may easily filter for all members paying by EBT by using the Payment Plan filter from the Subscriptions manager. To learn more about how to register to accept EBT payments, click here. To learn more about 2014 Farm Bill updates to SNAP benefits, click here.